This Christmas, Ray White is continuing its popular tradition of giving with the return of A Little Ray of giving. 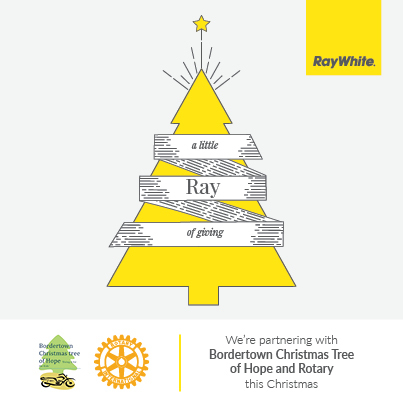 The inspiring Christmas campaign will see Ray White Bordertown & District partner with Bordertown Christmas Tree of Hope and Bordertown Rotary Club to help disadvantaged children who may need a little extra light in their festive season. This is the Second year that we’ve run a little Ray of giving and we want 2016 to be our biggest year yet. When you see our Christmas tree go up, we urge everyone who is able to bring in a gift in for those families who are less fortunate in our community. The gift drive is a way to help put a smile on the face of children and families who may need some extra cheer at this time of year, and it’s as simple as can be. All you need to do is wrap up your present and drop it under the tree into our office reception. Those who wish to donate a gift just need to inform the Ray White Bordertown and District team if the gift is for a boy or girl, and nominate an age group and we will ensure it goes to a good home. Ray White Bordertown & District are located at 62 Woolshed Street, Bordertown will have their special giving tree in their front window and will be collecting gifts from now. It’s a really simple way to put a smile on the face of a young child who might otherwise go without this Christmas, adding that just a small gift can make the biggest difference to families who are struggling at an expensive time of year. Ray White has run this initiative across Australia and New Zealand each December since 2012. Last year more than 300 offices across Australia and New Zealand helped raise 30,000 gifts for disadvantaged families at Christmas. And Remember…..we’re doing it for the kids.